Two visiting Singaporean anglers joined Boy at Bungsamran Lake in Bangkok fishing for carp and catfish. Fishing from a private bungalow the anglers fished sliding float set-up’s which incorporated fluorocarbon leaders with sliding bungs with stop knots set at variable depths. An inline feeder attached to a short braided hooklength and Owner hook completed the set-up which was loaded with local groundbait. In addition the anglers also heavily baited the nearby margins choosing to fish a 4oz Fox Method feeder hard on the bottom for carp. From the first cast the anglers hooked into a succession of big Mekong Catfish and Striped Catfish as the sliding floats literally hit the water! After landing a big Mekong Catfish of some 35kg’s an extremely fast take saw the rod being fished on the bottom exploding into life. Quickly the angler picked up the rod and wound down hard exerting as much pressure on the fish as humanly possible! A large swirl broke the surface layers as a big Giant Siamese Carp tried desperately to reach the nearby snags. After safely turning the fish from the snags the fleeing carp headed out into open water on another equally powerful run. Several minutes passed before the fish was finally netted by Boy on the second attempt. 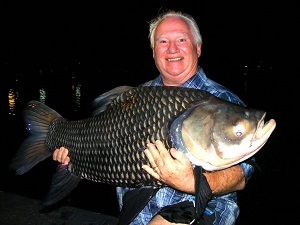 On hoisting the large Giant Siamese Carp onto the unhooking mat the fish was found to weigh 32kg’s. After rebaiting the rods the anglers waited for further action. A short time later the margin rod was away again this time heading straight towards the centre of the lake. As the angler bent the rod into the fish it was clear this was a much larger specimen and would take some time to land. A strength sapping forty minute battle entailed which saw the large Mekong Catfish fighting every last inch to the net. After half netting the monster Mekong Catfish the fish was hoisted onto the unhooking mat. The large Mekong Catfish was estimated to weigh 45kg’s. The anglers ended their hectic days fishing session with a twenty nine fish haul consisting of numerous Mekong Catfish with weights upto 55kg’s in addition to Striped Catfish to 9kg’s and a Giant Siamese Carp of 33kg.